Just 9 suites at Narina – just about perfect in our opinion if you’re looking for a personal and intimate lodge experience! 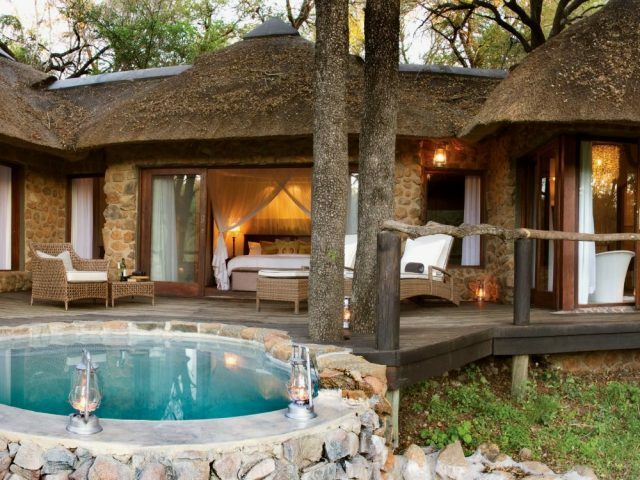 Not cheap – but then again you can’t expect to get a champagne game lodge experience for beer money!! what we really love about the spacious suites (they’re a huge 125 sqm!) is the close connection to the outdoors with their al fresco showers and private plunge pools, not to mention the free standing baths with their great views out over the river! Lion Sands Narina is one of the lodge’s on the Tinga private concession in the Kruger - 5000 hectares of some of the most abundant game in the entire park and boasting perhaps the highest leopard density in Africa! The concession is also home to a large population of the endangered black rhino and is the nesting site of the rare southern ground hornbill and saddle billed stork! Perhaps the key to this is that the concession enjoys 30 km of river frontage of the Sabie river and approximately 14 km of the Sand river – this not only makes for stunning physical beauty, but the presence of permanent water attracts a very high concentration of animals. 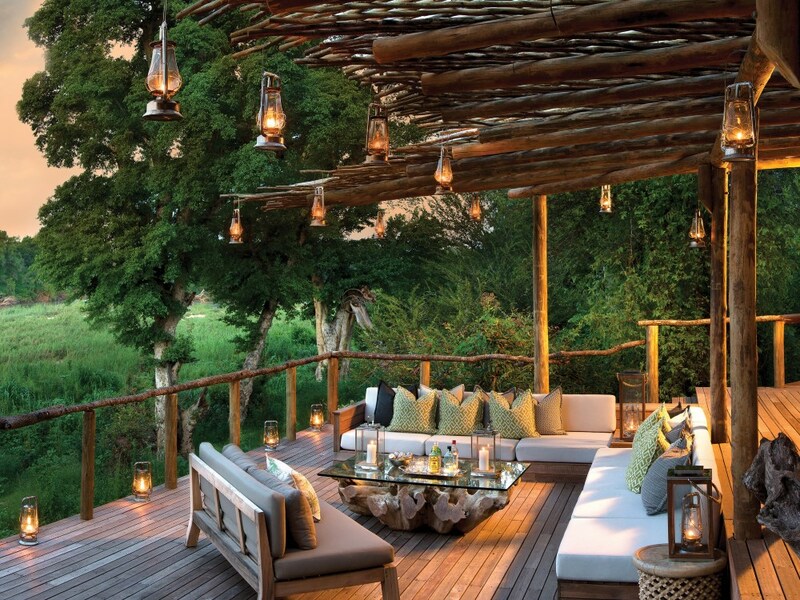 The concession is now managed by the More family who own and operate the famous Lion Sands lodges situated close by on the other bank of the Sabie River and hence in the Sabi Sands reserve - in fact, they have recently renamed both the Kruger concession lodges (Tinga and Narina) under this Lion Sands brand. This makes sense as the eco-system and hence the game viewing is essentially the same whichever side of the river you are staying, and the More’s intention is to basically manage the Kruger concession and the adjacent Sabi Sands property as one area. With no fences between the 2 areas, the large numbers of animals are free to roam as they wish and the very large selection of fauna and flora guarantees unsurpassed game viewing of the Big Five in a pristine natural environment! 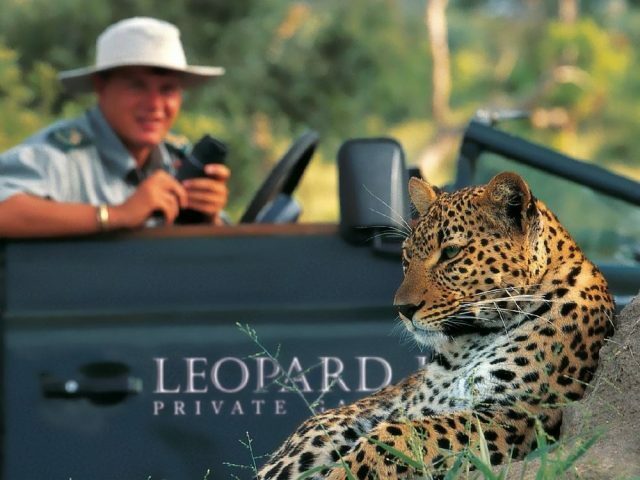 The twice daily game drives take place on the private concession exclusively and do not drive into the public part of the Kruger – one aspect to note is that the game vehicles on the concession are permitted to go off-road at confirmed Big 5 sightings, so the game viewing experience loses nothing versus the Sabi Sands in that respect either. Add in expertly trained rangers and trackers who are able to not only provide you with an encyclopaedia of information on all aspects of the ecology, but are also well versed in being incredible hosts and all the ingredients are in place for an incredible experience! 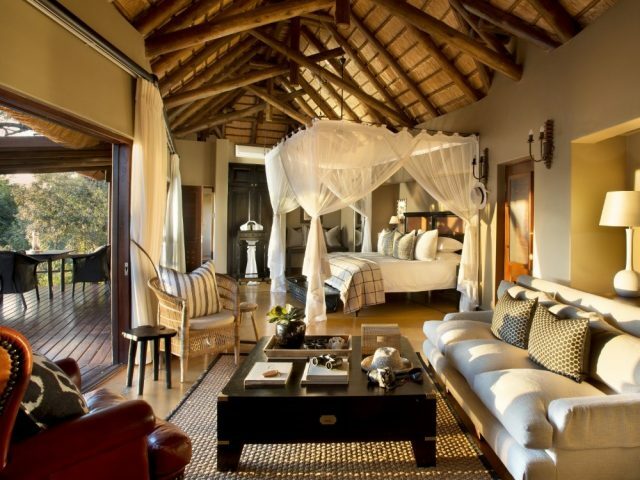 There are two lodges on the concession, Lion Sands Narina Lodge (previously named Tinga Narina) and Lion Sands Tinga Lodge (which used to be known as Tinga Legends) Whilst they are of very much the same standard and layout – each having just 9 luxurious suites on the riverbank overlooking the Sabie River – Narina definitely has a more African and slightly more rustic feel than the slightly more grandiose Tinga. With just 9 private suites tucked under a canopy of 100 year old trees overlooking the Sabie, a stay at Narina is a very personal and intimate experience – especially given the family-run aspect now in place with the More’s having taken over the running of the lodges here. The style at Narina is almost that of a (very luxurious) tree-house where the main areas are linked with raised wooden walkways! What we really love about the spacious suites (they’re a huge 125 sqm!) is the close connection to the outdoors with the al fresco showers and private plunge pools, not to mention the free standing baths with their great views out over the river! The suites all have air-conditioning and the beds are romantically draped with mosquito nets – you can choose to relax here, in your private heated plunge pool or perhaps slouched in a comfy chair on your terrace with an unobstructed view of the river below - watching a hippo, elephants or perhaps a herd of buffalo cooling themselves off in the heat of the day in the river below, whilst you’re doing the same in your own pool, is a once in a lifetime experience! Regardless of how many Animal Planet or National Geographic scenes you may have watched or even if you have travelled to other game reserves, you will not find a more natural and vibrant wildlife experience than at Narina! Here you’re pretty much guaranteed of getting close up and personal with a wealth of wildlife, including of course the Big Five. Game drives take place either in the morning or late afternoon moving into the early evening when the wildlife is most active due to the temperatures being the most moderate. It is also important to note that this area does not get affected by a migration of species which means that the game viewing is consistently good all year round and the only change in seasons is really to the surrounding landscape and daily temperatures. 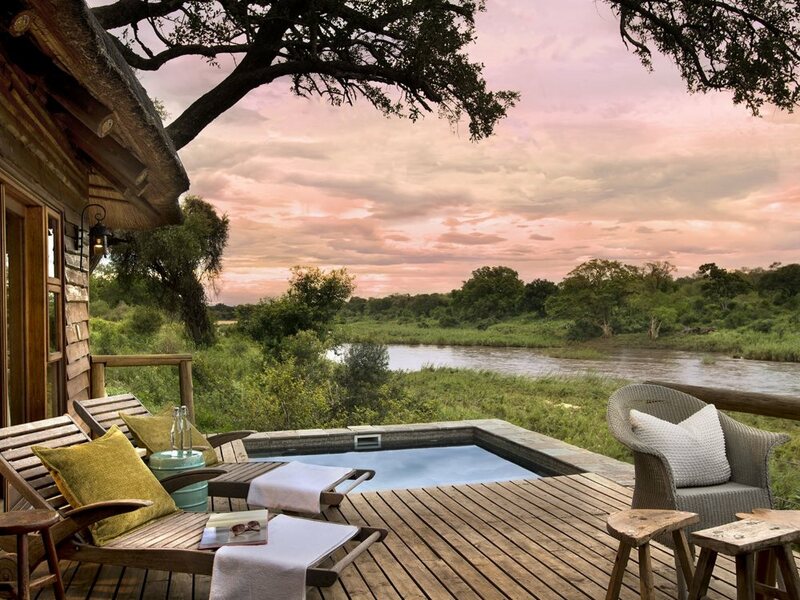 If you’re feeling active then you have the option of bush or river walks – otherwise you can just relax around the lodge as it must be said that Game sightings are exceptional at Narina. In winter, elephant and buffalo are seen daily, with large herds making their way down to the river in a cloud of dust. Lion prides are also frequently seen, lazing in the shade of large figs and leopards make an occasional appearance. White rhino are sometimes seen grazing in the evenings below the main deck. Other resident wildlife includes bushbuck, nyala, kudu, warthog, baboons and vervet monkeys. Hippos and crocodiles are present in the river and are often seen on the sandbanks. The large sycamore fig tree in front of the main deck attracts a myriad of birds, including broadbilled rollers, green pigeons, trumpeter hornbills and lilac-breasted rollers. Wood owls are often heard calling at night. Lion Sands Narina is definitely far more suited to romantics than families (no kids under 10 allowed, whereas sister lodge Tinga accepts from 6 years old and also has 2 family suites) Sitting out on the deck under the stars after a delicious dinner, what better than to indulge in a spot of astronomy. Ultimately a visit to Narina can completely restore your energy and refuel your soul so that you’re ready to again take on the rat race – at this beautiful spot on the Sabie river, surrounded by bush, animals and sky - you really do feel as though the hustle and bustle of everyday life has ceased to exist!